After starting the 2019 season with a 9-0 record, the North Marion Huskies' unblemished record was finally tarnished on Thursday night after falling 4-0 to the visiting Crescent Valley Raiders. It was a contest between baseball juggernauts closing out their respective non-conference schedules, with the 4A No. 1 Huskies putting their unbeaten record up against the top-ranked 5A team in the state, which was coming off an 11-0 win over Scappoose earlier in the day to improve to 9-0. It was also a duel between opposing pitching aces. 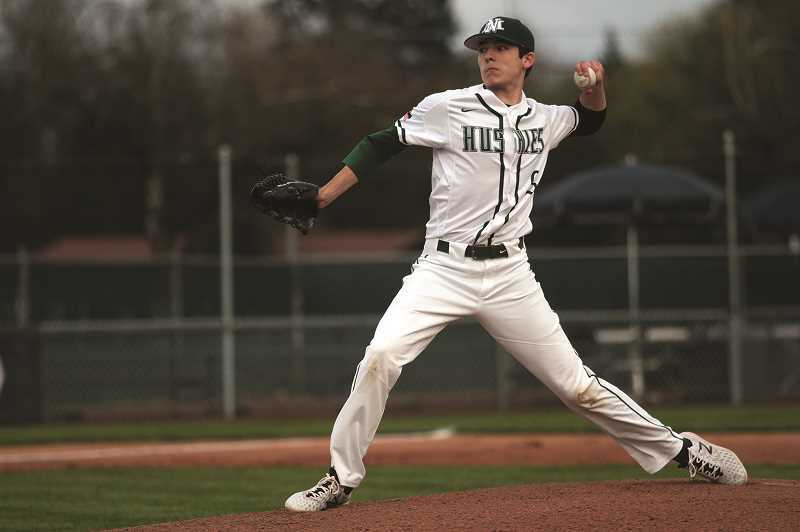 North Marion All-State senior Griffin Henry was coming off a two-hit, 14-strikeout performance in his previous outing, a 9-0 win over Philomath on March 29. Meanwhile, the Raiders were featuring junior Taylor Holder, an all-state honoree for last year's state runner-up team who has already inked his commitment to the Oregon Ducks for the 2021 season. Taylor showcased his D1 arm in the victory, holding the Huskies hitless in seven innings while striking out 11 to pick up the victory. Henry held his own, striking out five batters in the first two innings, but was pulled after third when the Raiders plated three runs en route to the win. Crescent Valley took its lead in the second inning when Dez Holmes hit a leadoff single, grounding up the middle to centerfield. Henry struck out the next two batters, but Holmes was able to move into scoring position on a passed ball with Roam Neff at the plate. Neff hit a quick grounder up the left side of the infield that caromed off the foot of third baseman Hunter Wierstra into foul territory, allowing Holmes to score on the play. Henry induced another strikeout in the next at-bat to end the damage, but the Raiders got back to work in the next inning. After a leadoff out, Ben Leid got on base with a grounder up the left side of the field and advanced to third on a double from Holder. Cleanup hitter Ethan Krupp brought home Leid with another single, and Holmes followed by taking four straight balls to load the bases. Two more walks brought in two more runs to make it 4-0 before Henry picked up his sixth strikeout of the night, followed by a pop out to shallow right field to finish the inning. Despite going hitless, the Huskies had their chances. Wierstra opened the bottom of the third by taking a pitch to the side and advanced to second on a wild pitch. Teammate Nic Iliyn followed by moving Wierstra to third on a sacrifice grounder. But in the next at-bat, Brady Hansen hit a fielder's choice up the left side of the field, and a moment of indecision by Wierstra on the base path was just enough time for the Raiders to pick him off at third base for the second out. Grant Henry followed by drawing a walk, and both he and Hansen moved into scoring position on a wild pitch to Griffin Henry. But Holder was able to catch Griffin Henry looking on a third strike to finish the inning, and the Huskies were unable to get another runner on base for the remainder of the game. Griffin Henry moved to right field in favor of sophomore righty Avery Coloumbe and the Husky defense held steady for the remainder of the game. Coloumbe gave up two hits and struck out a pair in three innings, and was relieved in the seventh by Grant Henry, who fanned all three batters he faced.